The UN has ruled out disarming Hizbollah by force. UN envoy Terje Roed-Larsen says it might not even be possible to force Hizbollah to stop its activities. Roed-Larsen says it would mean sending soldiers into the south of Lebanon, where even Israel couldn't survive. And into the Bekka Valley, where Syria was forced out of. The UN says it's not insisting that Hizbollah lays down its arms - they want the militia to join the Lebanese Army. Exiled former Syrian Vice President Abdul Halim Khaddam has made more startling revelations. He claims that a Palestinian member of the Israeli Parliament - Azmi Bishara (left) - has spied in Syria for Israel. The staunch fighter for Palestinian rights recently broke Israeli law by travelling to Damascus for talks. Khaddam says that was to carry messages from the Israeli government. Let's ignore for a second that the Israeli government recently tried to banish Bishara from Parliament for saying that Palestinians have a right to resist occupation. But Khaddam went further, saying that Bishara was in Syria to spy for Israel. Bishara put that to bed: "These are nonsense comments that have no tie to reality. The timing is weird and raises amazement." "The Syrian government has, in particular in the last three months, formally complied with nearly all of the Commission's previous requests for assistance." In his first report since taking over the UN inquiry into the murder of Rafiq Al-Hariri, Serge Brammertz says Syria is co-operating much more than it was before. "Despite these encouraging steps, it is important to note that the Commission will ultimately judge co-operation of the Syrian authorities on the merits of the information provided and the promptness with which its requests are being accommodated." 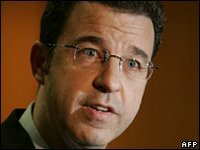 And for the first time the UN investigators have revealed that Bashar Al-Assad has agreed to be interviewed next month - Brammertz (below) is likely to travel to Damascus for that. He will also interview Vice President Farouq Ash-Sharaa (who was the Foreign Minister until earlier this year). It was a major complaint of Detlev Mehlis that Syria wasn't co-operating. Although, he praised the Syrian government's help when he was allowed in to Syria and when Syria sent all the witnesses that he demanded. But in his final report he slammed Syria, and said that he feared for his own life. That created a springboard for Bush to attack Syria from. But it seems like the probe into the death of Hariri has turned a page. No more politicking, no more 'statements' from independent investigators, no more pushing the envelope. Just a fair international inquiry into the murder of a Lebanese statesman. But why has the inquiry changed its face? Because of a change of mood in Syria, or because of a change of leadership in the UN Commission? If it is the latter, it casts a dangerous shadow over the work of Detlev Mehlis. A group of Syria's most important bloggers have built a site which should give the world a street-level view inside Syria. Syria Planet automatically republishes every post made by more than a hundred Syrian bloggers. Ayman - one of Syria's first bloggers - is behind the project. Sinan, Ayman, and Yazan also take much of the credit for the work. The incredible project will finally let the world read what Syrians are saying - unmitigated by SANA, Associated Press or the BBC. The creators think they've scooped up every Syrian blog on the net - but many more are being launched every day - go to the site to register your blog. In the most important meeting since the end of the Civil War, Lebanon's leaders have agreed that the Shebaa Farms belong to Lebanon not Syria. The Shebaa is occupied by Israel. The UN and America insist the land is in Syria - that means Israel has completed its withdrawal from Lebanon as required by the UN. 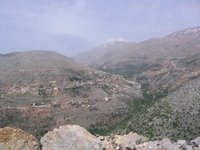 Understandably, Syria, and most Lebanese factions say the land is in Lebanon - it provides a justification for Hizbollah to keep their arms, and for Lebanon to hold off on a peace deal with their southern neighbour. That was always the vocal position of the Shia - the rest of Lebanon agreed by their silence. But now they've put their cards on the table. Walid Jumblatt was the only man to come into the meeting in disagreement. He brought maps in to prove the land was Syrian. This from the man who had been famed for a sickening anti-Semitic diatriabe that would have put Iran's Mahmoud Ahmedinijad to shame. But it seems he's all out in the cold now. They've agreed the land is Lebanese, the Washington Post reported today. All they need to do is persuade the UN, one participant said. There are reports that The Syria News Wire has been blocked by one Syrian internet company. Syrian Telecom has apparently taken offence to the content, and stopped its users from accessing this site. Yazan says it's bringing up a 403-Forbidden message. Can any other Syrian Telecom users confirm this? UPDATE 23.58: Syrian Telecom users are now confirming that The Syria News Wire is accessible - thanks to everyone who replied so quickly. The US has banned all American companies and banks from dealing with Syria. 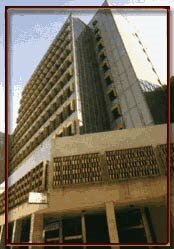 No American is now allowed to hold an account with the Commercial Bank of Syria, making life difficult for the many US residents in Damascus. But more importantly, it adds another hurdle for American companies to do business in Syria. Now, all earnings will have to be shipped out of the country in cash - a practically impossible situation. And it will undoubtedly push Syria back towards its tried and tested policy of economic isolation, at a time when Syrian reformers are trying to open the country up to foreign investment. French judges have released one of the Mehlis report's key suspects. 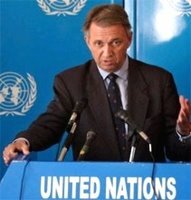 Detlev Mehlis was the former UN investigator into the killing of former Lebanese Prime Minister Rafiq Al-Hariri (below: his replacement, Serge Brammertz). He relied on heresay and testimony from anti-Syrian journalists and politicians, according to his critics. But he injected credibility into his report with two key Syrian witnesses. Mohammad Zuhair Siddiq and Husam Taher Husam. Last year Husam admitted that Sa'ad Al-Hariri had given him $1.3 million for his testimony to Mehlis that Lebanese officials and Syrians killed Rafuq Al-Hariri. He also claimed that the confession came under torture by Hariri. Meanwhile, the Mehlis Commssion asked French authorities to arrrest Mohammad Zuhair Siddiq, their other Syrian witness. They now suspect that he was involved in the murder. France arrested him on the basis that he had lied to the UN judges. But now they've released him, and dropped all charges against him. Apparently, the French legal system does not allow someone to be convicted without a very un-Lebanese concept: 'evidence'. Just weeks after the agreement between Michel Aoun and Hizbollah, the Shia group is demanding the release of 25 Lebanese prisoners being held in Syria. It's an unprecedented step - Hizbollah is regarded as a 'pro-Syrian' group in Lebanon, while Aoun has been moving closer to Damascus. The Support of Lebanese in Detention and Exile (SOLIDE) group hopes Hizbollah will use its relationship with Syria to get the men out of jail.